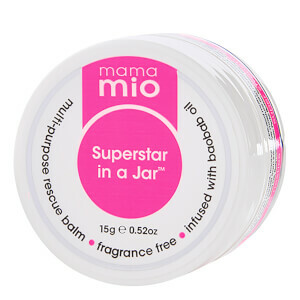 Keep hormonal breakouts at bay with the Mama Mio Gorgeous Glow Balancing Facial Wash; a lightly foaming, soap-free face wash that utilises natural Coconut-derived cleansers to refresh and revitalise your complexion. Infused with Tea Tree Extract and an Omega-rich blend of Organic Evening Primrose, Sweet Almond and Avocado Oils, the luxurious cleanser gently eliminates dead skin cells and impurities without over-drying or uncomfortable tightness. Experience a smooth, supple and rebalanced complexion with renewed radiance. Safe to use during pregnancy. Soap and SLS free. Apply with a little water, massage into face paying special attention to T-zone. Rinse well and pat dry. Aloe Barbadensis Leaf Juice, Aqua, Sodium Lauryl Glucose Carboxylate, Lauryl Glucoside, Cocamidylpropyl Betaine, Sodium Cocoamphoacetate, Glycerin, Lauryl Polyglucose, Sodium Cocoyl Glutamate, Coco Glucoside, Glyceryl Oleate, Melaleuca Alternifolia Leaf Oil, Prunus Amygdalus Dulcis Oil, Persea Gratissima Oil, Olea Europaea Fruit Oil, Oenothera Biennis Oil, Panthenol, Camellia Sinensis Leaf Extract, Lactic Acid, Vaccinium Myrtillus Fruit/Leaf Extract, Saccharum Officinarum Extract, Acer Saccharum Extract, Citrus Aurantium Dulcis Fruit Extract, Citrus Limon Fruit Extract, Caprylhydroxamic Acid, Glyceryl Caprylate, Alpha-Glucan Oligosaccharide, Polymnia Sonchifolia Root Juice, Maltodextrin, Lactobacillus, Anthemis Nobilis Flower Oil, Citrus Nobilis Peel Oil, Lavandula Angustifolia Oil, Lavandula Hybrida Oil, Limonene, Linalool, Mentha Arvensis Leaf Oil.